Back Door is a level in the Valley of Bowser in Super Mario World. 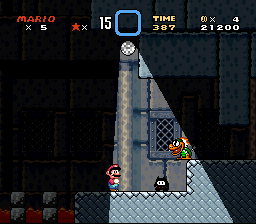 It is similar to the Front Door of Bowser's castle, but skips over the majority of the level, starting at the "dark" room. The eight doors are skipped entirely, making Bowser's Castle much easier. The only difference in the "dark room" from the Front Door path is a Midway Gate just before the fight to Bowser. The battle with Bowser is unchanged, as is the credits and ending scenes. It can be accessed through a secret path in the Valley of Bowser, specifically after the completion of the level Valley Fortress. A reference to this level was made in New Super Mario Bros. Wii. By taking a secret exit from the World 7 tower and finishing the secret level, it is possible to go through a secret entry to the World 7 castle, skipping almost the whole level, except for the final Sledge Bro and the door to Ludwig von Koopa. A similar reference is made in New Super Mario Bros. U (and as such, New Super Luigi U), where the player can take a shortcut (and the final Star Coin) in Roy's Conveyor Castle/Roy's Ironclad Castle by using red switch blocks to get behind the castle. If Super Mario Advance 2 is played on a backlit Nintendo handheld (such as a Game Boy Advance SP or Nintendo DS Lite), the background in the dark section of the level will be so bright that the red ? block light is actually not needed to complete the level. This is because those systems are backlit and this game was intended to be played on a non-backlit Game Boy Advance. In Super Mario Advance 2, even after the player defeats Bowser, it is impossible to leave the Back Door without quitting the game or losing a life. This page was last edited on April 9, 2019, at 03:06.